Robert Nesta Marley was born on February 6, 1945 on his grandfather’s farm in the rural interior of the island of Jamaica. His mother was an eighteen year old Black Jamaican named Cedella Malcolm. His father was Capitan Norval Sinclair Marley, a White member of the British Army who was in his early sixties. Bob spent most of the early part of his life in poverty and all of it without a father present. For the first twelve years of his life, besides a short stay in Kingston, he lived in the rural interior of the island. He usually resided at his grandfather’s farm but he also herded goats for his aunt for about a year. In 1957 Marley moved to Kingston to reunite with his mother who lived in the city’s west-side ghetto known as Trench Town. Here Bob and his mother were exposed to open sewers, disease, malnourished children, and violence. Although the conditions were harsh, this was the place where Bob would cultivate his musical talents and draw inspiration for many of his political and philosophical messages. Bob Marley dropped out of school at the age of 14. He began to sing cover versions of songs and eventually fashioned instruments out of makeshift materials. Marley derived his distinctive “reggae” style of music by combining elements of Jamaican music called Ska and U.S. Rhythm and Blues. In 1962, at age sixteen, Marley produced his first recordings. One year later he began recording with the original members of The Wailers, a collaboration that would last until the group disbanded in 1975. Although the original members were gone, Marley kept the name of The Wailers and continued to record music and tour until his sickness and eventual death in 1981. 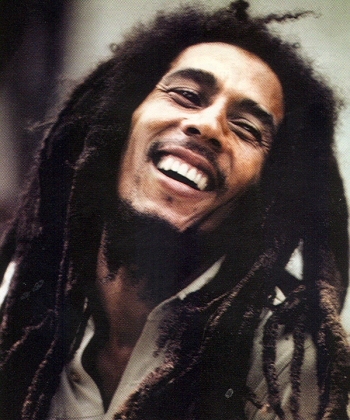 Marley died on May 11, 1981, at the age of 36, from cancer in his stomach, lungs, and brain. In a short life, Marley left a tremendous legacy. His music transcends social boundaries, and it could be argued that he is more popular today than he was in life. Since 1991, ten years after his death, over 21 million Bob Marley records have been sold. His greatest hits compilation, Legend, released after his death, has sold more than 12 million copies alone. Marley’s music was often laden with political messages including commentary on political and economic oppression. Marley was also known for his belief in Rastafarianism, a religion combining aspects of Catholicism with elements of various African religions. In evidence of Marley’s great popularity and lasting impact, he was inducted into the Rock and Roll Hall of Fame, has received the Grammy Lifetime Achievement Award, and was awarded the Jamaican Order of Merit.